The Macally XKEY is a wired keyboard for mac that aims to provide an Apple-like typing experience for a budget price. You won’t have to deal with a weak connection between your keyboard and the computer nor will you have to constantly change batteries. More affordable than the Apple Magic Keyboard but with amazing quality. At Macally, we believe in our products. That's why we back them all with a one-year warranty and provide friendly, easy-to-reach support for any of your questions. ELEGANT DESIGN WITH ERGONOMIC TILT/KICKSTAND - The low-profile keys of the computer wired keyboard give you a quiet, comfortable typing experience and are integrated into a sloped frame to maximize comfortable and precise typing. PLUG & PLAY WITH NO BATTERIES NEEDED - Simply plug in the USB cable and start typing. NEVER WORRY about replacing those pesky batteries and losing connection with our external corded keyboard. 16 EASY MEDIA SHORTCUTS - With 16 Apple shortcut keys (cut/copy/paste, music control, Volume up/down, etc.) for Mac OS X, you will be able to increase your kb typing speed or process through tedious or repetitive actions quicker. FULL-SIZED KEYBOARD WITH 17 NUMPAD - The extended keyboard with 104 keys makes data entry input extremely effective and easy with numeric pad. 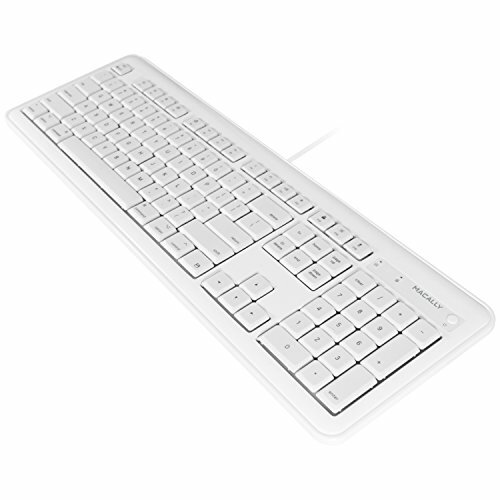 BUDGET REPLACEMENT for APPLE KEYBOARD - Usually, a new Apple Magic keyboard can be quite pricey; however, with the XKEY, you don't have to break the bank for a high quality / reliable iMac, Mac Mini, Mac Pro, Macintosh Desktops / Laptops, or MacBook Pro / Air compatible keyboard.